What’s happening with NHS orthodontic contracts? UK dentistry has long been a somewhat turbulent landscape and the recent changes to NHS orthodontic contracts once again disrupted the way the profession is structured. Historically, NHS orthodontic contracts have always been time-limited, but those who held them have been confident that their contracts would be renewed. As such, the practices have held their value, often fetching up to six times their EBITDA (Earnings Before Interest Taxes, Depreciation and Amortization). This has presented a viable long-term business model for dental professionals in the field and made contracts fairly attractive for potential buyers. In 2017, an announcement was made by NHS England that rocked the boat. A number of contracts are due to expire in early 2019 and it was broadcast that a nationwide procurement process to award new contracts would be performed at this time. This meant that all existing contracts had the potential to be re-tendered and the confidence in existing contracts being renewed reduced significantly. The result was that goodwill values plummeted and practices with NHS orthodontic contracts were left unsure of whether they would retain contracts beyond their existing agreements. The good news is that at least some of that confidence has been restored, with a very positive outlook seemingly on the horizon. Managed on a regional basis, it has since been confirmed that in some areas of the UK, this deadline will not be met for the procurement process to be completed. However, in certain regions, we have already seen NHS orthodontic contracts awarded ready for April 2019. Practices are starting therefore to find out whether their existing businesses will continue or if they have acquired a new contract – although this is expected to continue for a few months yet so there’s no need to worry if you haven’t yet had a decision. Many practitioners have been asking what these new contracts are worth and if they can be sold as they were before. 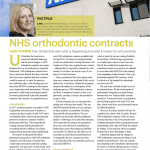 Despite the temporary slump in the market as a consequence of the tendering process, NHS orthodontic contracts are likely to remain as lucrative as they were previously, and they even have the potential to go up in value. For the most part, they are structured in a similar way to the previous model. They are still PDS (Personal Dental Services) contracts, so there certainly is a possibility of selling the goodwill with no problems. The new contracts are also longer than the traditional tenders – following a seven plus three structure. This means that all contracts are guaranteed for seven years and may be extended for a further three years where targets are fulfilled successfully. So effectively, this offers seven years plus an extra three for good behaviour. Consequently, the new contracts are more secure than those that were sold last year for six times their EBITDA. Despite a slight reduction in UOA (Units of Orthodontic Activity) values in some areas of the country, the enhanced security of the new NHS orthodontic contracts makes them very profitable. It also has great potential to make them more attractive to potential buyers, which is great for anyone wanting flexibility for the future. With the longer agreements, we would expect values to start where they left off, but would not be surprised to see valuations increase to as much as six and half to seven times their EBITDA in the coming year, depending on their location. This is not far behind standard NHS contracts, which is reflective of the demand for orthodontic services in the UK. The only issue with this is that it is as yet an untested theory. We have had reports of professionals struggling to acquire finance because their new contract hadn’t actually started yet. It seems the bank was reluctant to provide finance prior to the April 2019 start date, which could leave several potential buyers in a difficult position. However, it is likely that this will only be a problem for a short while. In reality, the new NHS orthodontic contracts will be a scarcer resource than they were in the past and with continued demand for them among patients and professionals, their value will likely be realised by lenders. If you need any advice or support, the experienced team from Dental Elite would be more than happy to help. It therefore appears that the changes to NHS orthodontic contracts may bring several benefits to the profession. They are certainly not something to be immediately dismissed and are all set to continue offering practice owners a lucrative and sustainable business opportunity.